The storm drain grate cover offers great protection for street drains. Constructed from a high strength filter fabric, these storm drain covers slide quickly over grates to filter out sediment, debris, oil, and other pollutants. Easy to install and maintain, these grill grate covers provide reliable protection for any construction site. Each grate guard model is available in range of sizes to accommodate different job sites and drainage requirements. Questions about a sewer grate cover? We can help! Call the GEI Works team at +1-772-646-0597 or fill out our quote request form to discuss your spill guard containment requirements. 18" x 24" x 4"
30" x 32" x 4"
In order to absorb oil, the storm drain covers will include an absorbent pillow that fits directly underneath the drain grate. Pillows can be replaced as needed. How Does the Storm Drain Grate Guard Keep You in Compliance? Looking for a long-term sewer grate cover? We recommend our GEI Works manufactured Taurus Filtration products. Their long field life, and ability to be used long term, provides significant cost savings to users. Regular maintenance keeps these products filtering silt, sediment and trash. 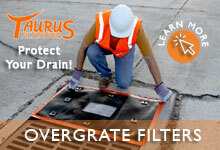 Even better, the Taurus over grate filter can be installed by one person without lifting heavy drain grates. Questions about a drain grate cover? We can help! Call the GEI Works team at +1-772-646-0597 or fill out our quote request form to discuss your spill guard containment requirements.